1) Coat trout fillets in crushed crackers to coat, pressing crumbs to adhere to fish. 2) Heat oil in a large skillet over medium-high. Add trout and cook until browned on both sides, turning once, about 8 minutes total. 3) Meanwhile, combine cabbage, carrots, parsley, and bacon in a large bowl. Whisk together mayonnaise, vinegar, sugar, salt, and pepper; pour over vegetables and toss well. 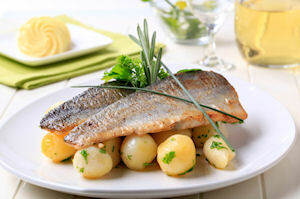 4) To serve, place trout on plates; top with slaw.